TVS will showcase the all-new NTorq125 scooter at the upcoming Auto Expo 2018. 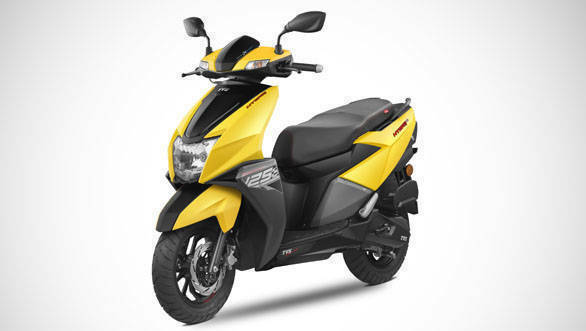 The scooter was launched yesterday in Chennai and is priced at Rs 58,750 (ex-showroom Delhi). The Auto Expo will give visitors a chance to view the scooter as well as explore its features. The most interesting feature is the digital instrument panel with Bluetooth connectivity, a first for a scooter in India. The TVS NTorq125 is powered by a 124.79cc, three valve, single-cylinder engine that develops 9.4 PS at 7,500rpm and 10.5Nm at 5,500rpm. Visit the Auto Expo to see the new TVS NTorq125 as well as a wide range of motorcycles, scooters and cars. Also, watch this space for the latest from Auto Expo 2018.